This extract is from ‘In Shoal Waters’ by the late Charles Stock. It tells the final stages of his early ventures further afield from his home waters of the East Coast in May 1949 when he decided to take his 16ft. 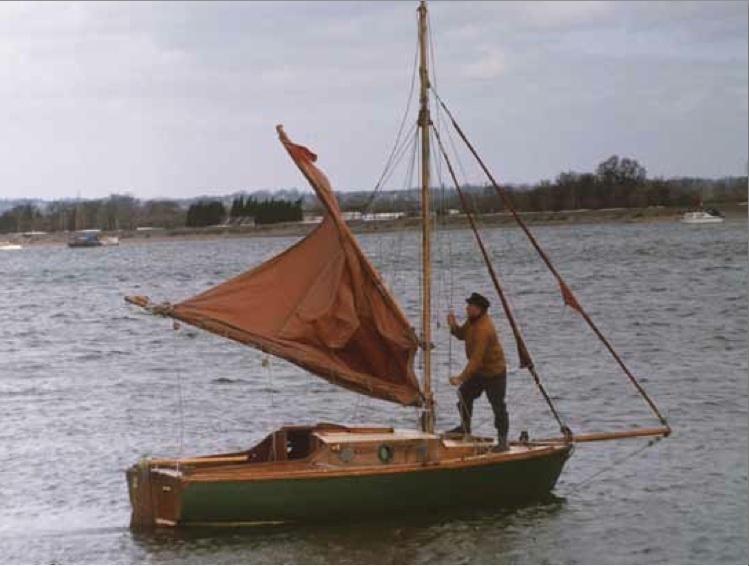 half-decked gunter-rigged sloop, ‘Zephyr’ from Herne Bay, Kent to the Isle of Wight. We are grateful to Lodestar Books for permission to bring this extract from the highly engaging account of 60-plus years plying the inland and coastal waters of south-east England, mostly singlehanded, the last half-century in the tiny gaffer ‘Shoal Waters’ herself. Described as the ‘nautical autobiography of a singular sailor’ by the publisher, Lodestar Books, ‘In Shoal Waters’ provides an engaging account of single-handed sailing over the past 60 years or so. For the last 50 years, the author sailed in his small gaff cutter ‘Shoal Waters’, now owned by Tony Smith and still sailing the East Coast, achieving second place for Class 2 boats in the Anniversary East Coast Race on 27 July 2013. ‘Shoal Waters’ also took part in the first East Coast Race in 1963. Wednesday started with a fine breeze from the north-west as I left the harbour at 0445 hrs, but it soon died away, leaving a calm sea under an overcast sky. In order to be able to kedge East Coast fashion, I kept inside the five-fathom line, which was clearly marked on my half-inch road map. Off Hythe at 0830 hrs the sea was like a millpond and the wind had gone completely. When the anchor went down I found that the tide was flowing strongly to the east. Some sporadic fire from the shore came in my direction and a look at the map showed that I was to seaward of some rifle ranges. I weighed up the choice of a stray bullet or a tide-borne trip to Ostend and decided to stay put. After an hour or so the firing ceased, only to be replaced by an equally annoying plague of tiny flies, which smothered everything for the rest of that sultry day, and I gradually grew to hate the distant hooter that must have been the Romney, Hythe and Dymchurch railway as I busied myself with jobs about the boat. Dark clouds came racing in from the east at teatime, so I hauled in the anchor and set the sails ready for some wind. Then I took a second look and decided to reef down. The wind hit me before I could tie in the reef points, but as I was going downwind the sail set well enough. However, it was then I decided that when the time came for a new mainsail it would have to be loose-footed. After the first few vicious gusts, the wind settled down to a good blow from the north-east. Once round the flat shingle headland of Dungeness at 1800 hrs, ‘Zephyr’ was into the smooth water in the lee of the land and I began to look for the entrance to Rye, which was not covered by my map of East Kent. Suddenly we were in shallow water. A furious bout of sounding across the entrance failed to find any sign of a channel, so I anchored as close as I could to the harbour training wall, which seemed prudent. The tide was rising, and by anchoring so that I could see water all the way into the harbour, I was able to sail in after making and drinking a cup of tea, the time I reckon it takes for the water to have risen by more than the draft of my vessel. My entrance was made easier by the fact that a local boat appeared just at the right time and I was able to follow her in, and I noted that it must be a grim place indeed when the wind blows hard onshore. Once into the narrow channel the high banks on either hand took all the wind, and I kept her in mid-channel with an oar while the tide swept her along. The banks were very steep on either side and I looked in vain for some safe shallow mudflats on which to moor for the night. Just below the town, which stands on an island rising above the marshes, the main channel leads off to port, but I didn’t realise this and swept on by. Suddenly the channel swung round to starboard, with a low bridge ahead, so I anchored at once in midstream. So strong was the flood tide in the River Rother that the boat swung and tugged about her anchor like a mad thing. Over on the western bank against the town I could see a number of fishing smacks were moored to rough wood jetties and was tempted to tie up alongside one of them, but thought better of it. As the tide quickly rose I could see that the steep mud slopes flattened out for a few feet inside the cant of the saltings. At high water I moved over to the eastern bank, and moored up with a line ashore from the masthead to an anchor in the saltings so that she could not fall outwards when the tide left. It was 0130 hrs before she settled down on the firm mud, by which time the wind was now blowing hard; I was glad to be in somewhere safe. Thursday was fine and I awoke to find a trickle of water left in the channel a long way below me. The fishing smacks were all moored fore and aft without springs and the slack necessary for the big rise and fall meant that they took the bottom well down stream of the jetties. Rye turned out to be a charming little town, very much in the style of Maldon, and among my purchases was another half-inch map to take me on as far as Bognor Regis (the one-inch series would have been too expensive). As the early afternoon tide advanced, one of the smacks awoke from her slumber and swung upstream with a sharp jerk on her mooring lines. The bowline broke with a sharp crack, letting the boat swing round through 180 degrees to round up with a sickening crunch alongside the next boat upstream, whereupon her stern line snapped. Released into the mercy of the strong tide, she drifted towards the bridge. A deckhand on another moored smack lassoed her stempost and took a turn on his own craft to stop her but she had a mind of her own that day. The stempost just tore out and, as I watched with horrified amusement, she disappeared under the bridge, and I was thankful I had not moored alongside her the previous night, for, apart from the damage to ‘Zephyr’, I might well have been blamed for the whole sorry episode, and I had no insurance cover. The wind was blowing as hard as ever at midday high water so I decided to stay for another twelve hours. It was flat calm under a full moon when the tide returned at midnight, so I left with the ebb, paddling with one oar to keep the boat in the middle of the channel. The chimes of Rye town clock rang out for miles over the open marshes in the cool night air. When I noticed that patches of mist seemed to be moving steadily past me, I hoisted the sails and found steerageway to the entrance. It was 0230 hrs by the time I was clear of the long harbour and ‘Zephyr’ settled down to make the best of the steady north-westerly breeze. We bowled along merrily with the track of the moon between the shrouds as I lay back across the stern seat wrapped up in my greatcoat (my beloved duffle coat had been lost when I took it off and laid it on top of our van, and forgot it when we drove off.) I even managed to get the end of the tiller into my pocket to keep my hands warm. The cliffs at Hastings loomed out of a golden sunrise at 0530 hrs but the sun soon killed off the wind to leave a flat calm by the time the tide turned against me at 0830 hrs, and the morning was spent kedged while I caught up on sleep. But a gentle breeze appeared with the afternoon ebb to help me to beat slowly round Beachy Head. Visibility was poor as ‘Zephyr’ crept slowly level with Cuckmere Haven, at which point the tide turned against me once more. While I was anchored, a large motor yacht came over and offered me a tow but I declined, for there is a terrible strain on a small boat towed above her normal speed. Nevertheless it was a nasty spot and I reefed down before squeezing into my bunk with the cabin top still down, ready to clear out in a hurry if necessary. A cool breeze on my face woke me after what seemed just a few minutes. Surely the tide couldn’t have turned already to let a south-westerly wind blow straight into the open end of the tiny cabin? My watch showed that it was only 0230 hrs; the wind must be coming from the east. In a matter of minutes the reefs were shaken out, the anchor was on board and the little boat was once more on her way. The wind hardened steadily and I soon reefed again, but I was being over-cautious for almost at once the wind began to ease. By keeping the reef in too long I lost several miles, but it came out at first light off Shoreham and the spinnaker went up at 0600 hrs for a fine run past Worthing. Once more the tide turned against me, so I kept close inshore, every detail on the bottom showing up clearly through the shallow water. As the sun rose, however, the wind built up again, the prelude to another perfect day, and Littlehampton slipped by at 0900 hrs. I had planned to put in there, but in view of the fair wind decided to press on. The haze made things difficult and my map ended at Selsey Bill, so off Bognor I steered out to sea to avoid Bognor rocks, which sounded dangerous to an East Coast man used only to mud banks. I unshipped the spinnaker boom, taking the tack of the sail to the bowsprit as a reaching jib, and gradually the Bill came into view and I began to search for the Looe Channel, navigating with Reed’s Almanac, which gives a very good description of the Mixon Beacon. In fact it was easy to find for it stands out boldly. A lucky glimpse of the white cliffs at St Catherine’s Point beyond the Nab Tower at 1215 hrs gave me a course to steer for the Isle of Wight; lucky because it was another hour before I saw the island again. The wind increased steadily as the working jib, and then the reef points, came into play on what was a glorious broad reach to Bembridge, which I entered on the top of the tide at 1530 hrs, escorted by a fleet of the famous Redwings. It looked very good indeed as I had a leisurely meal before beaching on the western shore to call on a friend from the Broads, who had watched my arrival while umpiring a cricket match at Bembridge School. Something attempted, something achieved, remains the best formula for contentment and happiness; I was a very happy and contented fellow that afternoon!